EPA's guidance has been requested on the demolition of structurally unsound buildings damaged by Hurricane Katrina. Various federal regulations apply to building demolition activities. Areas of primary federal concern include asbestos demolition requirements, the proper disposal of electrical equipment containing PCBs (i.e., distribution transformers and capacitors) and storage tanks. EPA recognizes the difficult circumstances faced in demolishing structurally unsound buildings damaged by Hurricane Katrina may make full compliance difficult. However, in any event, you should take the actions set forth below to the extent feasible. Efforts to restore the damaged areas to their pre-disaster condition often involve removing or repairing damaged structures. There may be a natural tendency at this stage to overlook certain hazards, such as asbestos, that are not immediately life threatening. However, such hazards are serious and may manifest themselves many years from the time of exposure and should be taken into consideration. Given the health hazards associated with asbestos, PCBs, lead, and other harmful substances, it is reasonable that adequate measures be taken during emergency situations to minimize exposure to such materials from the demolition of buildings. The following guidelines are provided to help minimize the health, safety and environmental risks associated with the demolition of structurally unsound buildings (structures that remain standing but are in danger of imminent collapse). In the case of such buildings it would be unsafe to enter or inspect a structure to determine the amount, types, and location of building materials containing asbestos, PCBs, lead, or other harmful substances. This guidance does not apply to the demolition of hurricane damaged but structurally sound buildings. This guidance remains in effect through December 31, 2005, and applies only to areas damaged by Hurricane Katrina. Releases of petroleum or hazardous substances from underground storage tanks (USTs) and above-ground storage tanks (ASTs) present significant health, safety and environmental concerns and thus should always be addressed with care. If, for example, gasoline pumps, pump station islands or vent pipes are present near a damaged building, or if an unknown tank or cylinder is discovered, halt all demolition activities, seal off the area and call the state environmental agency. Federal asbestos regulations do not apply to the demolition of structurally unsound buildings by private individuals who contract directly with the demolition contractor for the demolition of a residential building they own having four or fewer units. However, EPA strongly recommends, for health reasons, that anyone conducting demolition activities follow this guidance. Asbestos-containing products, which may be part of this debris, include: asbestos-cement corrugated sheet, asbestos-cement flat sheet, asbestos pipeline wrap, roofing felt, vinyl-asbestos floor tile, asbestos-cement shingle, millboard, asbestos-cement pipe, and vermiculite-attic insulation. All structures (both residential and commercial) built before 1975 may contain significant amounts of asbestos. In particular large structures built before 1975 typically contain asbestos pipe wrap, siding, ceiling tiles, and other building materials high in asbestos content. Additionally, structures built after 1975 may also contain asbestos. Persons conducting demolitions should notify the appropriate state/local air quality management program as early as possible prior to the start of the demolition, but in any event, no later than the following workday after starting the demolition. At least one person, either a government official or private contractor, trained in the asbestos NESHAP regulations should be on site or available by cell phone during the demolition to provide assistance and guidance. In all instances, workers should use equipment specifically designed to protect them from asbestos exposures during demolition and handling of debris, especially respirators, as required under OSHA. Heavy equipment that is used to demolish structures or that is run over debris from the hurricane will rupture the building materials and may cause asbestos to be released. Therefore, it is very important to wet the structure before demolition and keep the structure wet during demolition. Wetting the structure is crucial because it reduces the potential for air migration of asbestos. EPA recommends knocking down each structure wall-by-wall, folding it in on itself to minimize excess breakage of asbestos containing material. Keep the debris wetted and covered until it is possible to consult with the asbestos trained person to segregate out asbestos containing material to the extent feasible. If asbestos is known to be present but can not be safely segregated, dispose of all the debris as if it is asbestos containing materials as discussed below. After you have collapsed the structure, if feasible, place the asbestos containing material into leak proof wrapping. If the volume of the material precludes use of leak proof wrapping, continue to wet the asbestos containing material and use heavy lifting equipment to place the asbestos containing material into waiting dump trucks. Whenever possible, use a plastic liner in the bottom of the bed of the dump truck to minimize the leakage of contaminated water from the dump truck. If the asbestos containing material has been further broken up during the loading process, wet it down again after you load it into the dump truck. Cover the dump truck with a tarp, sealing it so that debris and dust can not be released during transport. Truck the debris to a landfill allowed to receive asbestos. Contact state authorities for a list of asbestos approved landfills. Maintain your waste shipment records. The original guidance for PCBs has been superseded by "Guidance for Addressing Spills from Electrical Equipment". If other hazardous or unknown materials, such as lead, non-liquid PCBs, solvents, pesticides, herbicides, varnishes, pool chemicals, industrial grade cleaning solutions, etc., are discovered during demolition, please immediately contact the state environmental agency for further guidance on the management of that material. Other debris created by the demolition of structurally unsound buildings that do not contain asbestos, PCBs, lead, and other harmful substances, should be disposed of in an appropriate landfill or burned pursuant to the Emergency Hurricane Debris Burning Guidance issued by EPA. These guidelines do not supercede emergency orders which may be issued. EPA is providing the following guidance for addressing spills from electrical equipment damaged by Hurricane Katrina or Hurricane Rita. Areas of primary federal concern include the proper disposal of electrical equipment containing PCBs (i.e., distribution transformers and capacitors). EPA recognizes that individuals, contractors or others involved in removing electrical equipment or utilities restoring electrical service in areas damaged by Hurricane Katrina or Hurricane Rita face difficult circumstances that may impede full compliance. However, in any event, you should take the actions set forth below to the extent feasible. Efforts to restore the damaged areas to their pre-disaster condition often involve removing or repairing damaged electrical equipment. There may be a natural tendency at this stage to overlook certain hazards, such as those associated with PCBs, that are not immediately life threatening. However, such hazards are serious and may manifest themselves many years from the time of exposure and should be taken into consideration. Given the health hazards associated with PCBs, adequate measures should be taken during emergency situations to minimize exposure. This guidance remains in effect through December 31, 2005, and applies only to damage and spills resulting from Hurricane Katrina and Hurricane Rita. The guidance in this document supersedes the PCB guidance in EPA's "Demolition Guidance For Structurally Unsound Buildings Damaged By Hurricane Katrina." Caution! Downed electrical equipment including transformers may still be energized which could cause injury. De-energized capacitors and batteries may still contain a charge. Generally, transformers that were mounted on utility poles are liquid filled and some may contain PCBs. Air cooled or dry type transformers do not contain PCBs. In the absence of identifying information, it is best to assume a transformer may contain PCBs. To screen transformers for the presence of PCBs, you can use a field screening test kit. A positive test indicates the potential presence of PCBs. A negative test indicates no presence of PCBs. The location of the downed equipment should be identified using e.g., GPS, some kind of visual marker along with a log book with descriptive locations, etc., because this will help you address future clean-up of any spill associated with the downed equipment. If the electrical equipment is intact, it can be stored for reuse, preferably in a clean, dry area. If the electrical equipment has a small leak that can be controlled so that no additional liquid leaks from the unit, it can be stored for repair and reuse after controlling the leak, preferably in a clean, dry area. Intact electrical equipment and equipment that has small leaks that have been controlled can then be shipped without a manifest to a repair facility for evaluation and repair. If the electrical equipment has significant leaks, any remaining liquid should be drained into a non-leaking container. If the field screening test kit indicates the liquid contains PCBs, the container should be labeled with the PCB M L as containing PCB liquids, and ultimately sent to a chemical or hazardous waste incinerator for disposal. The drained electrical equipment carcass should be disposed properly. If containers with drained liquids must be stored temporarily, they should be placed on hard surface areas, such as a concrete or asphalt parking lot for no more than 90 days. If the leaking electrical equipment cannot be drained, the electrical equipment should be placed in shipping containers, or covered roll-offs with a poly liner or sorbent material to prevent further spread of the spill, intermodal containers with a poly liner or sorbent material to prevent further spread of the spill, or other weather-tight containers. Electrical equipment from parties unable to manage their equipment may be consolidated at electrical utility-owned locations or other temporary storage or staging areas. Where possible, temporary measures should be implemented to prevent, treat, or contain further releases or mitigate migration to the environment of PCBs. Where possible, the location of the spill should be identified to determine if it correlates with downed equipment. Where possible, the boundaries of the spill area should be identified with paint or flags to facilitate future clean-up. Generally, after the equipment has been sent to the repair facility, the presence and concentration of PCBs in the equipment is determined. This information can be used to address the spill. If the PCB concentration in the equipment was greater than 50 ppm, you should clean-up the spill. All soil with visible traces of the spill should be excavated and placed in weather-tight containers, such as a covered and lined roll-off or intermodal container. If these containers must be stored temporarily, they should be placed on hard surface areas, such as a concrete or an asphalt parking lot for no more than 90 days. 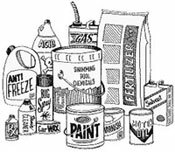 The excavated material should be disposed in a TSCA or hazardous waste landfill. If the spill is the result of an empty or leaking piece of equipment which has not been tested, some testing of the soil may be necessary to identify if PCBs are present. If PCBs are present in the excavated material, the waste should be sent to a TSCA or hazardous waste landfill. For further information, please contact the EPA Regional PCB Coordinator for your area. EPA's guidance has been requested on the collection and disposal of debris from Hurricane Katrina, including vegetative, structural, and mixed debris. Various federal regulations may apply to portions of such debris, although some federal regulations such as the asbestos demolition NESHAP do not apply to debris from structures already demolished by natural disasters (as opposed to human demolition). We recognize that the extraordinary circumstances you face in removing the debris may make full compliance difficult. However, you should take the actions set forth below to the extent feasible. The following guidelines are provided to help minimize the health, safety and environmental risks associated with burning hurricane debris. Piles to be burned should be at least 1000 feet from the nearest residence or roadway. Piles should be separated by at least 1000 feet and not be more than 45X45 feet in size. Prevailing winds should be monitored, and burning conducted so that smoke does not create a traffic hazard on roadways or impact nearby citizens. Protective clothing (dust masks or respirators, safety glasses, etc.) should be worn, if available. Initiative should be taken to keep the local public informed. These guidelines do not supersede emergency orders which may be issued.